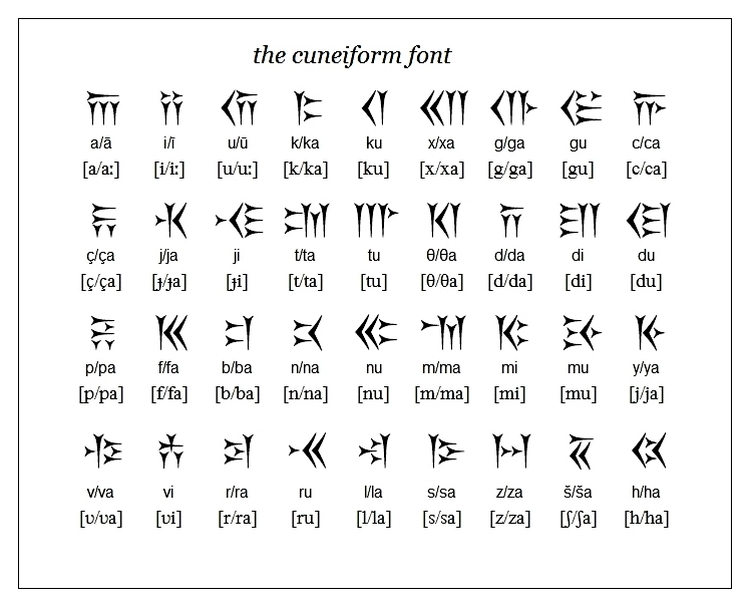 Soon after I first translated the Minoan Linear A words reza, adureza and tereza, it swiftly dawned on me that I had made a fundamental critical error in my decipherments. It is this. 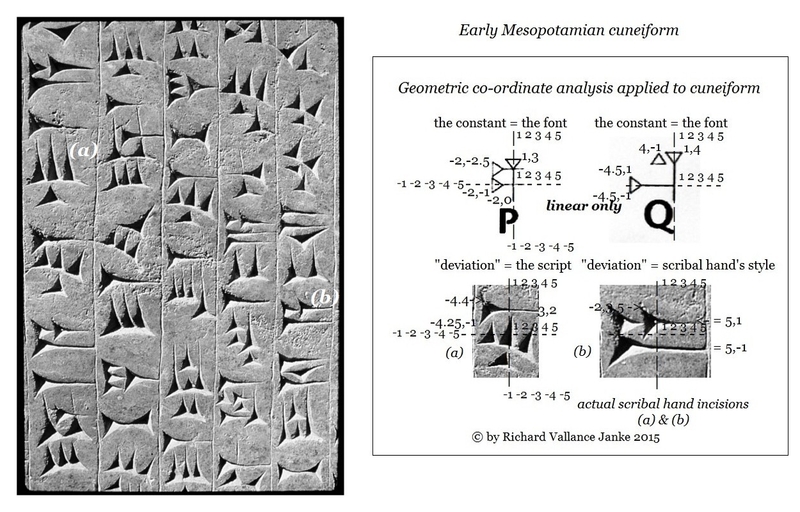 Based on the operation that cross-correlation between Minoan Linear A and Mycenaean Linear B assumes that both scripts fundamentally centre on inventories alone, I first turned to Linear B to test this hypothesis. 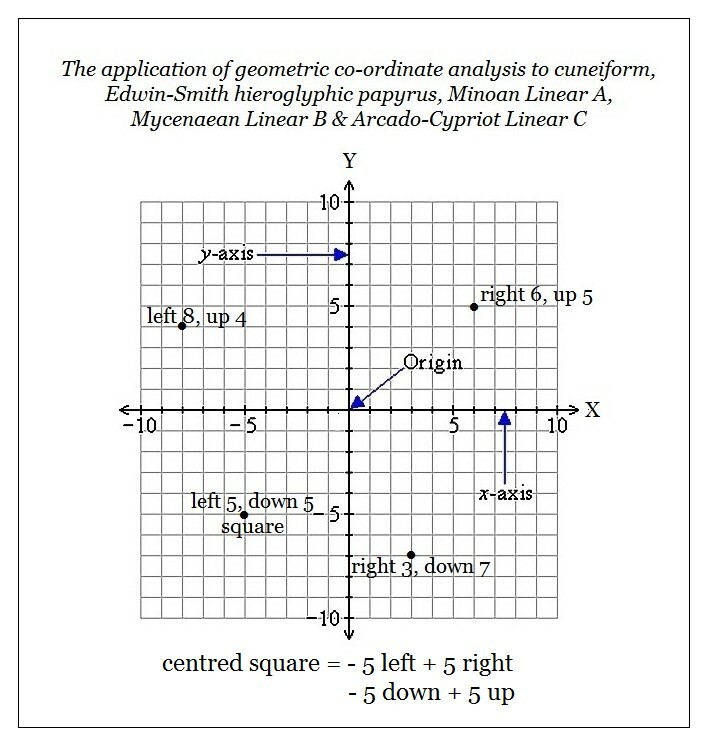 And so I have come around to reasoning that what applies to the designation of specific measurement in Mycenaean Linear B must also apply to its forbear, Minoan Linear A, in some form or another. Unfortunately, my extensive online research rummaging for Minoan Linear A words (as opposed to units of measurement) came up cold. So what then? Did the Minoan Linear A scribes employ precise words for specific units of measurement? My believe is that in fact they did. Why so? Only recently, I quickly noticed that the words reza, adureza and tereza appeared on Minoan Linear A tablets, all of which dealt with measurement. Co-incidence? I think not. I would also like to stress that so far I have only scratched the surface of the problems inherent to at least the partial, but accurate, decipherment of certain Minoan Linear B terms (up to a potential vocabulary of 100+ words), in light of the fact that I have been painstakingly mulling over the hypotheses, criteria and a specific methodology which can successfully be applied to the prudent decipherment of at least a subset of Minoan Linear A. And to my satisfaction, I have been able to extrapolate these hypotheses, criteria and a specific methodology which we can practically apply to said decipherment. I shall be posting these principles very shortly here on Linear B, Knossos and Mycenae. I guarantee they will be real eye openers to past, researchers in the potential decipherment of Minoan Linear A, all of whom have overlooked some of the critical factors relative to its decipherment, which are more than likely to lead to at least a real measure of success. We shall soon see. It is extremely important to emphasize that if adureza and teresa are compounds of reza, compound Minoan Linear A words modify their meanings from their simple root word, in this case, reza, by adding prefixes, not suffixes, which would explain why adureza, with the prefix adu = “dry” means a specific unit of dry measurement and te for tereza refers to a specific unit of  “wet” measurement, not just “measurement” (reza). It will be absolutely necessary to test this tentative hypothesis against other Minoan Linear A word clusters composed of (a) a root root and (b) compound terms composed of the root + 1 or more prefixes, not suffixes, to determine whether it holds up to continued scrutiny. If it does, we are surely onto something big! For adureza and tereza, see the next two posts. Those of you who are regular readers of our blog, and who take the trouble to really delve into the fine points of our posts on the decipherment of scores of Linear B tablets which we have already translated, will have surely noticed by now that I never take any translation for granted, yes, even down to the very last word, phrase, logogram or ideogram, while strictly taking into account whether or not the tablet itself is completely intact, or – as is far more often the case - left- or right-truncated. In every instance of the latter, any decipherment, however carefully devised, is likely to be considerably more inaccurate than any translation of an intact tablet. 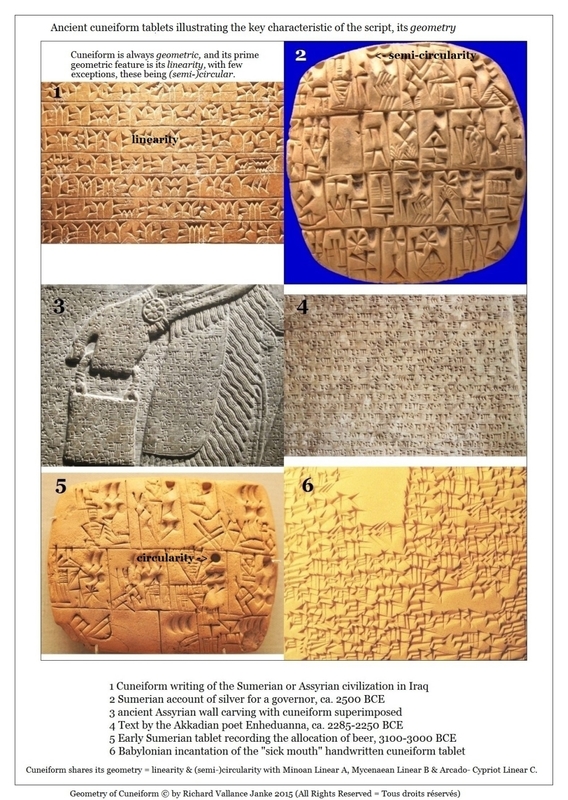 Not to follow these strict procedures would be tantamount a one-sided, highly subjective and excessively biased exercise in imposing a single, strictly personal, interpretation on any extant Linear B tablet, a practice which is fraught with so many pitfalls as to invite certain error and misinterpretation. I would much rather offer all alternative translations of every single last word, phrase, logogram, ideogram etc. 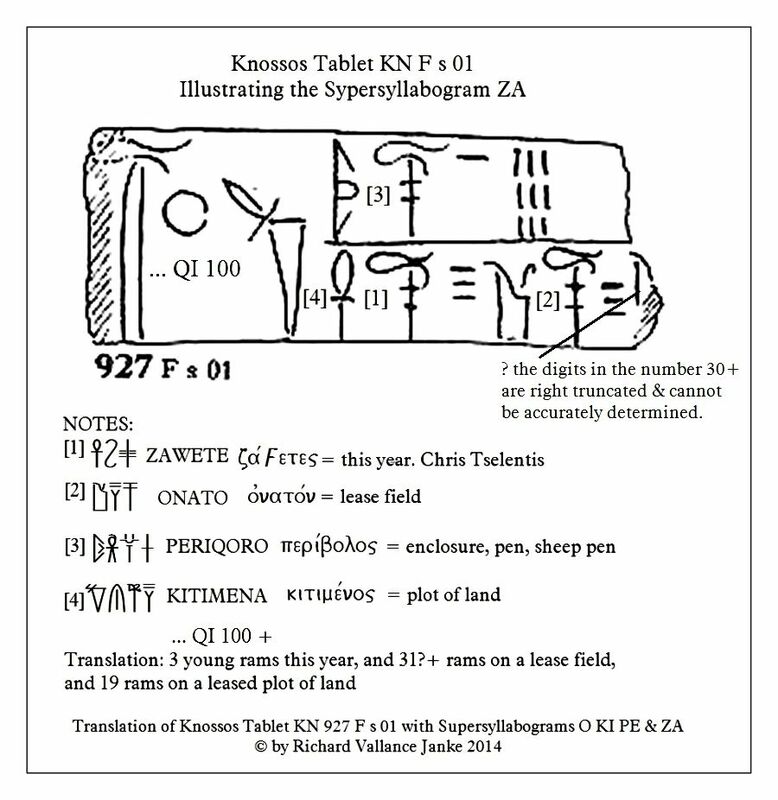 in any and all Linear B tablets, than to rashly commit myself to any single translation. It is only in this way that you, our readers, can decide for yourselves which of my translations appears to be the most feasible or appropriate to you in the precise (or more likely than not, not so precise) context of the tablet in question. No decipherer or translator of Mycenaean Linear B extant tablets or text in his or her right mind has a monopoly on the so-called “right” or “correct” translation of any Mycenaean source, because if that individual imagines he or she does, that person is dreaming in technicolour or – dare I say - even high on psychedelics. The only people who had the very real monopoly, in other words, the actual precise meaning of each and every tablet or source firmly in hand in Mycenaean Linear B were – you guessed it – the Mycenaean scribes themselves. We absolutely must bear this critical consideration in mind at all times whenever we dare approach the translation of any Linear B source, if we are to maintain any sense of the rational golden mean, of our own glaring linguistic inadequacies at a remote of some 3,500 years, and our own decidedly limited cognitive, associative powers of translation, which are in fact extremely circumscribed at the level of the individual translator. It is only through the greatest sustained, systematic international co-operative effort on the part of all translators of Linear B, let alone of Linear C or of any other ancient language, regardless of script, that we as a community of professional linguists, can ever hope to eventually approximate a reasonably accurate translation. The greater the number of times a (Linear B) tablet is translated, the greater the likelihood that our sustained, combined co-operative efforts at translation is bound to bear positive fruit. Those who insist on being loners in the decipherment or translation of any texts in any in any ancient language run the severe risk of exposing themselves to sharp critical responses and, in the worst case scenario, to public ridicule in the research community specializing in ancient linguistics. Caveat interpres ille. That sort of translator should watch his Ps & Qs. Since that time, the tablet has been translated scores and scores of times. Several translators have gone so far as to claim that theirs “is the best translation”. If you will forgive me for saying this, people making such an injudicious claim are all, without exception, wrong. It is only by combining, cross-checking and cross-correlating every last one of the translations attempted to date on this fascinating tablet, Pylos Tablet PY 641-1952, that we can ever hope to come up with at least one or two translations which are bound to meet the criteria for a really top-notch translation. Those criteria are several. I shall address them one by one, finally summarizing all such criteria, throughout the coming year. In the meantime, stay posted for the latest carefully considered, extremely well-researched and eminently consistent translation of this famous tablet, with fresh new insights, by Rita Roberts, soon to be posted right here on this blog. It is not my own translation, but trust me, it is a highly professional one, fully taking into account a number of historical translations, one of the best of which is that by Michael Ventris himself. I freely admit I could not have matched Rita’s translation myself, for reasons which will be made perfectly clear when we come to post her excellent decipherment early in March 2015. To my mind, it is one of the finest translations of Pylos PY 631-1952 ever penned. Ms. Leonhardt’ s decipherment is, if anything, unique and - shall we say - intriguing. We shall see how it stacks up against Michael Ventris’ and Rita Roberts’ translations, meticulously cross-correlating her own translation of every word or ideogram which is at variance with that of the same word or ideogram in either of the other two decipherments. Each translation will then be subjected to a range of rigorous criteria to determine in which respects it is as sound as, or inferior or superior to its other 2 counterparts. Of course, the table of merits and demerits of each of the three translations is strictly my own interpretation, and as such is as subject to sound linguistic, logical, contextual and practical counter-criticism as any other. Anyone who (strongly) disagrees with my assessments of each of these 3 translations should feel free to address his or her critiques of them. I shall be more than happy to post such criticisms word-for-word on our blog, with the proviso that both Rita Roberts and I myself are free to counter them as we see fit under the strict terms enumerated above. This résumé, which I repeat below in a slightly less compressed format, but without the examples of supersyllabograms in Linear B, serves as the basis of a much more in-depth institutionally sponsored paper, The Rôle of Supersyllabograms in Mycenaean Linear B, which is to be published before the end of this year, and which may even appear in other venues. A supersyllabogram (SSYL) is defined as the first syllabogram or vowel, i.e. the first syllable of a Linear B word or phrase, and it is always found adjacent to or inside an ideogram, and always with the same invariable meaning in a particular sector of Minoan/ Mycenaean society. Sectors include agriculture, military, textiles, vessels & religious. If the ideogram or the sector changes, so does the meaning of the supersyllabogram. “What!”, I hear you saying. 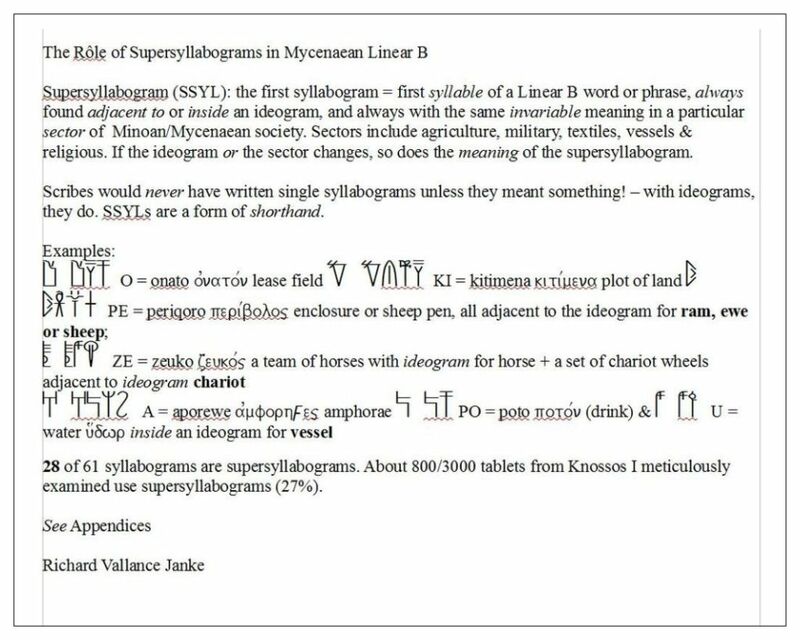 “I thought you said that super- syllabograms always appeared singly adjacent to or inside an ideogram in any sector of Minoan/Mycenaean society.”  But if you re-read what I said above, that is not quite what I said. 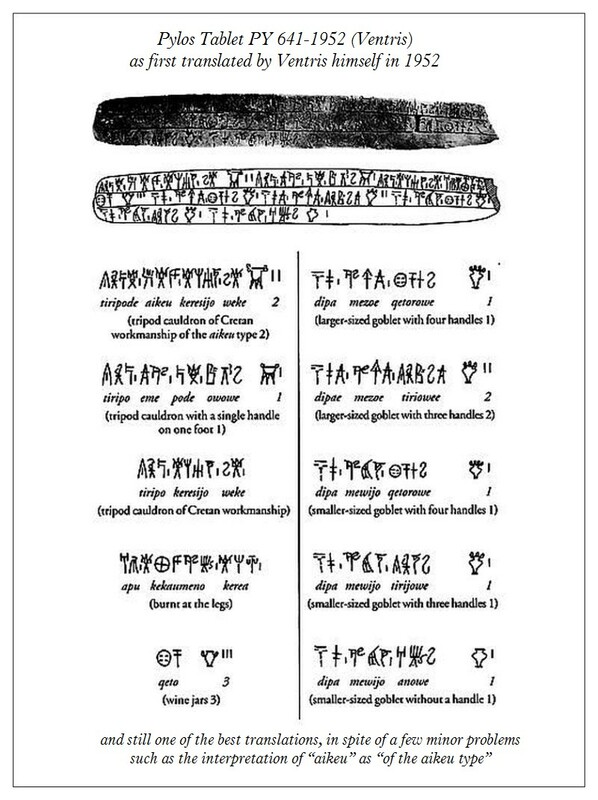 I pointed out that a supersyllabogram is always a single syllabogram or vowel, and the first syllable only of any Mycenaean word or phrase in Linear B. I did not claim that more than one supersyllabogram could not appear adjacent to or inside an ideogram. To the contrary. Scribes frequently resorted to using as many as four (4) SSYLS on one tablet, thereby eliminating all extraneous text, which would have otherwise wasted much valuable space on what were (and are) extremely small tablets. Few tablets exceed 30 cm. in width or 15 cm. in depth. Some are so tiny you have to look at them through a magnifying glass to read them! The scribes knew exactly what they were doing. The fewer words or phrases they had to write out, the more space they saved on the tablets... which is precisely why some 800 of 3,000 tablets (27%) from Knossos, which I examined and read meticulously use supersyllabograms to replace words and even entire phrases in Mycenaean Greek. Scribes would never have written single syllabograms unless they meant something! - with ideograms, they do. SSYLs are a form of shorthand. See the visual post above for examples of Supersyllabograms. 28 of 61 syllabograms (46 percent) are supersyllabograms. About 800/3000 tablets from Knossos I meticulously examined use supersyllabograms. 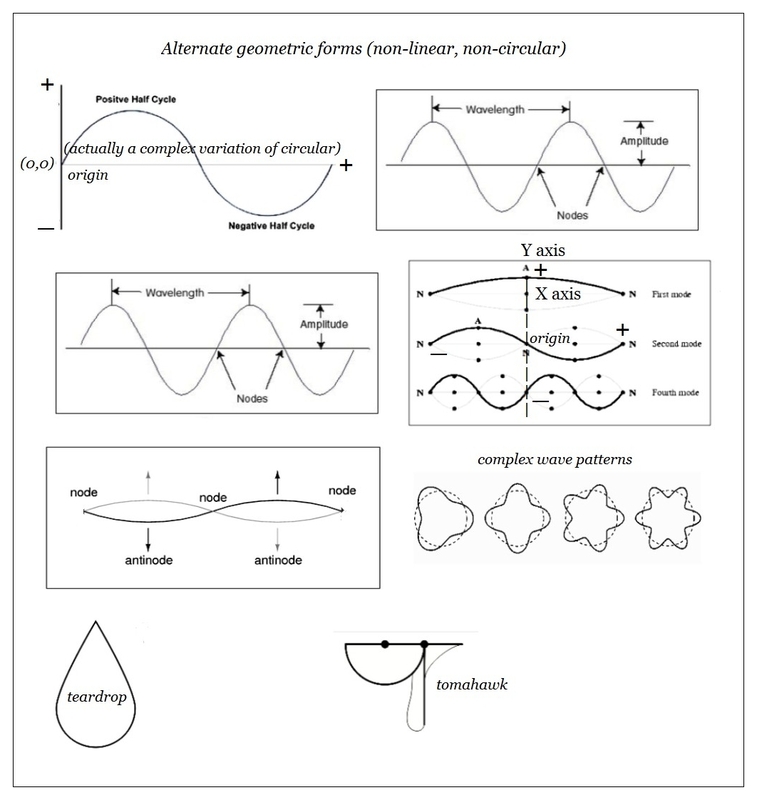 In the next post, we shall discuss the idiosyncratic characteristics of supersyllabograms.